I cannot write too much about this dish before actually giving you the recipe, since you have to make this rather quickly. Firstly, because it is utterly delicious, and secondly, because this dish depends on all its components being at the height of their existence: in absolute high season. And let me tell you: winter is coming (I was woken up by crows shouting this morning – no kidding). At least these last days here in southern Germany: I have started to put on a jacket again and I am wearing thick woolen socks as I’m writing this. So: Get to your nearest farmer’s market, harvest everything you need, and treat yourself to this plate of summer. There are a lot of great things about being home. (Can my plan to keep it short before the recipe anything but fail after such a first sentence?) Proverbially speaking, it is where the heart is, your (or an Englishman’s) castle, a place like no other, and – apparently, it is also where the chickens come to roost, and where you bring the bacon. (does a quick online search ever fall short on delivering even the weirdest results?) I love being home. Don’t get me wrong: I love traveling and seeing new things, and I sometimes really need to – I am a change person. But I also love the chickens and the bacon. Being and staying home doesn’t mean more of the same every day to me. Not in a boring way at least. Rather, home is the perfect lookout point for experiencing change: against the backdrop of the reassuringly consistent, even the little changes become all the more apparent and can become exciting. And the changes of the seasons are among the most exciting to me, especially when it comes to food. Maybe I’m a bit dull, but maybe you just have to have the right mindset to celebrate the small things – you decide. 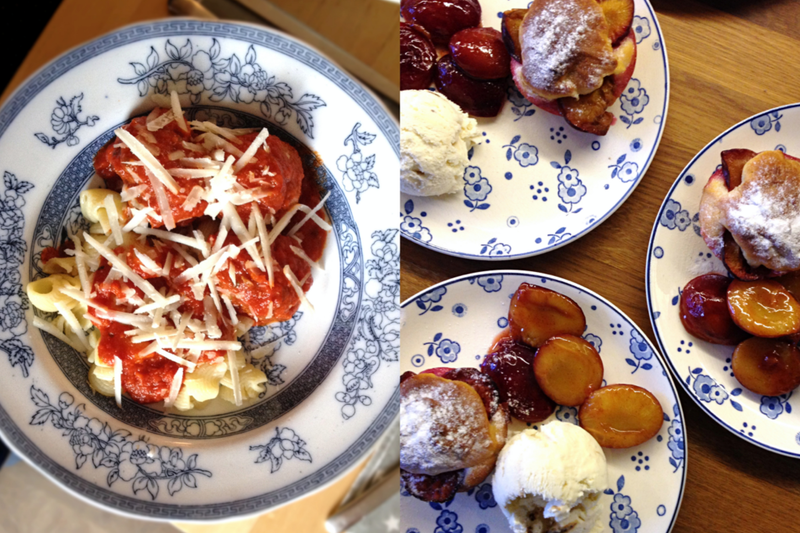 So when we came home from our summer holiday the other week, I was giddy with joy to find my favorite food season had finally arrived back home: when we left for the island, the local tomatoes were already quite nice and sweet. When we came back two weeks later, the tomatoes were so ripe and plump they started to burst and there were mountains of green beans everywhere. I love this high (to late) summer season on a market: when you walk by a stall, you almost smell a finished dish, since all the produce is so aromatic. A (German, locally grown) tomato really is a tomato and a delicacy only during these few weeks in high summer, and beans never taste the same anywhere outside of the season. 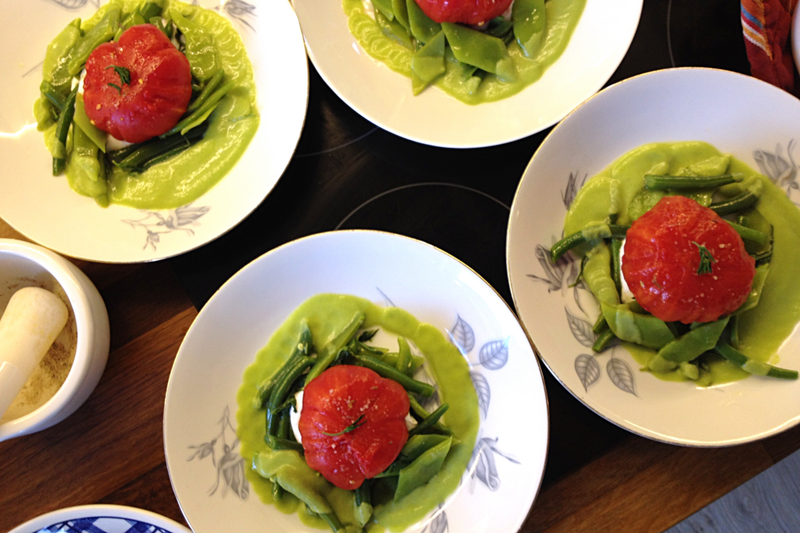 My anticipation for cooking with my two favorite summer vegetables was triggered by two recipes by German chef Joachim Kaiser. I found them in an issue of Feinschmecker (=Gourmet) magazine at our holiday home. Kaiser served a roasted tomato with herb salad, and lamb cutlets with green bean stock. (I tried to find some photos of his dishes for you online but couldn’t find any) I loved his ideas, especially since I LOVE the sweet and aromatic taste of baked tomatoes, but it seemed a pity to me to only have the beans in the form of a puree, and my mind kept on compulsively putting the two dishes together. So eventually, my hands did as well. A great occasion to try this salad came in the form of a recurring cooking date which Alex and I have with our friends Conny and Christian and Simone and Olivier. The six of us meet once every few months (apparently much too seldom – I managed to miss three quarters of a pregnancy between our last date and the recent one) and cook three courses together, with each couple providing for one course. We usually don’t tell the others what we’re doing in advance, so there’s always a surprise menu, great company, and lots of romping around with the ever growing number of the most adorable children these two couples have. I savor these afternoons. Although we don’t meet that often (which we realized this time and which we will definitively change), this little tradition is part of what makes ‘home’ for me. And this time, it seemed, the menu we put together spoke a lot about home – as a feeling or sensation. Simone and Olivier’s main course arrived in two large stewing pots and filled the kitchen with the most amazing aroma of spices and sweet, dense tomato sauce. They made a luxuriously large batch of Alain Ducasse’s meat balls with pork and fennel, and lamb with pistachios and chinese five-spice (which I love, and which together with lamb is definitely on my investigate-further-list now). A heavy lidded pot on the stove, slowly giving away the ever developing aromas assembled on its inside, which then permeate the whole room after a while and envelop you in anticipation for the result, is one of the iconic images of homeliness to me. Christian and Conny’s dessert featured several of my favorite homely aromas at once – aromas that invoke images and memories of childhood to me: the cozy smell of yeast dough, the comforting taste of cooked milk, and the heartening perfume of caramelized sugar and stewed fruit came together in a wonderful dessert plate of little plum tarts with homemade milk ice cream with balsamic swirls and stewed fresh plums. The most beautiful thing about sitting around the table and eating all this together was (and is always) watching the kids eat. It tells you that, just like you associate tastes, consistencies, smells and dishes with home and good times today, so will they one day, and that everyone sitting around the table laughing, chatting and happily munching away, is building on what these little people will call, think of as and long for as ‘home’ one day. 1 This dish has 4 components: the bean salad, the slow-baked tomato, the goat’s cream cheese, and a bean emulsion. First, prepare the vegetables. Put on a large pot with lots of water and bring to a boil, then add salt as if you were cooking pasta (i.e. : be generous). If you can find really ripe ones, you should be able to peel the skins off with a sharp knife. If not, prepare a bowl if water with ice and submerge the tomatoes in the boiling water for about 30 seconds, then transfer to the ice water and peel off the skins. Thread the beans if necessary and cook them separately for about 8 minutes each variety, then cool them off quickly in the ice water. Lastly, quickly dip the savory sprigs into the boiling water (2 seconds) and also cool down in the ice water. Don’t leave the vegetables in the ice bath for too long, or they will lose their aroma – when they’re cold, get them out and drain them. Tap the savory sprigs dry with a kitchen towel. 2 Cover the peeled tomatoes in olive oil, place in a ramekin, sprinkle with salt and pepper and bake at 100 °C for about 25 minutes. The tomatoes should be soft and sweet, but the flesh should still be intact. Meanwhile, cut the beans in 1″ pieces in an angular cut, pluck the savory leaves from the sprigs and set aside. 3 For the dressing, finely mince the garlic and mash it up with some salt to make a puree. Then add 4 tbsps of apple cider vinegar, pepper to taste and whisk in about 6 tbsps of olive oil, turning it into a thickish emulsion. Put in the savory leaves and set aside. For the bean emulsion, put 200 g of the beans into a tall container, add 100 ml of cold water, and puree with a handheld blender. Strain it through a sieve, add 1 tbsp of apple cider vinegar and slowly pour in 3 cl of olive oil while blending away, so that everything turns into a smooth, bright green emulsion. Adjust the salt and set aside. Now tumble the beans in the salad dressing. 4 To assemble the dish, place about a tablespoon of the goat’s cream cheese in the center of each plate. Then, pour the bean emulsion around, creating a little pond. 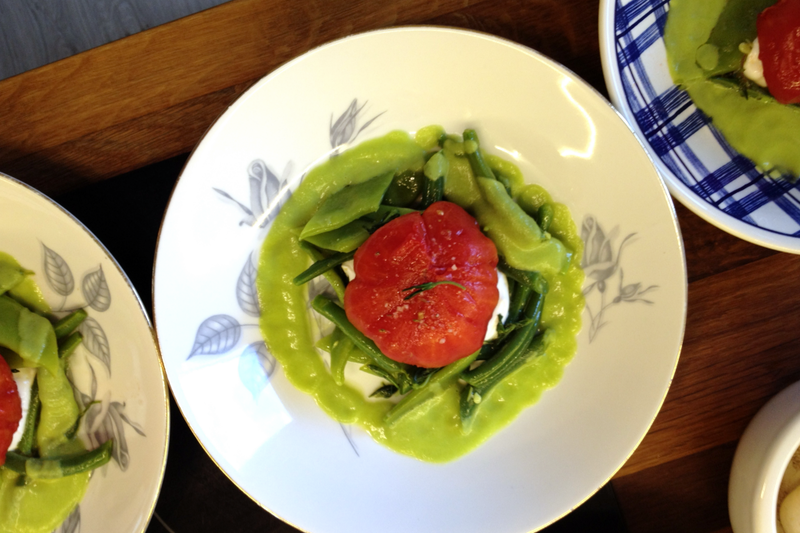 Arrange the bean salad around the goat’s cheese like a little nest, in which you then place the slow-baked tomato. To finish it off, sprinkle the top of the tomato with a coarse sea salt of your choice. Serve right away. Looks like I missed the high season for this dish, but it’s beautiful nonetheless. Are bobby beans just green beans? I’ve never heard of them before.